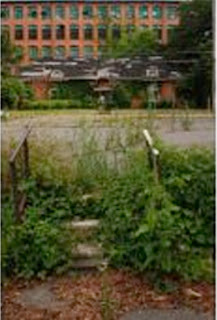 Collectivism: Deeply Embedded In "Economic Development"
This picture of the Firestone/Loray Mill is poor quality, but is from our local newspaper, The Gaston Gazette. The small building in the front is the former office space of the mill and though you can't see it terribly well, the roof of that building is falling in badly. The large building also has a tower in front of it, not shown here, that has a Firestone insignia on it. The large building is approx. 600,000 sq. ft. Hope you like it because you are now paying to renovate this thing for "mixed use" development on the government dime. There is a part of our town that is under the shadow of an old textile mill. It was once a hive of manufacturing activity and mill houses where workers lived. Since textile manufacturing was decimated here by "free trade" policies, that section of town has fallen on hard times. (Contextually, we have all fallen on fairly hard times, but those in this area had less cushion to fall on.) A huge mill stands empty and neglected. It was owned by Firestone who would have torn it down, but for the vociferous objections of the "Historic Preservation - North Carolina" crowd. Firestone ended up donating the Mill building to "Historic Preservation - North Carolina for a tax credit just to avoid the smears. Plus, the building is in such dilapidated shape that no buyers could be found. Just tearing it down would be quite expensive. The building is so huge that 3000 people used to work there. That is big. But its claim to fame is that in 1929 a Communist union uprising took place against the owners of the mill. Riots and shootings occurred and before it was over, the Sheriff was murdered and a middle aged female operative for the unions was also shot and killed. This uprising was famous across the country. Sympathies for this mill and its history are prevalent in this town on several levels, not for the ownership or the thriving private enterprise factor, but for the working class and for the union uprising. The grown children of former workers are all bent out of shape to save the mill because their parents worked there. The derogatory name of "Lint Head" has become a badge of honor. The work they did, once looked down upon, is now heralded. After all, when someone puts their work into something, it is a matter of pride. Understandable. Totally. But the union uprising is Communist at its core. Many people here do not understand that or don't care about that. We are now looking at a collectivist's dream. Years of begging and pleading with various government agencies have resulted in a HUD / FHA guaranteed loan ($34-39 million) to a private developer , city commitments to lease 20,000 sq. ft., and our county doing the same for another 20,000 sq. ft. The State of NC already granted Historic status to the building which relieves the property taxes by half. So, we are looking at 4 levels of government subsidies to renovate this one building. The surrounding area is known for crime, prostitution, drugs, and lower economic class homes. It's sad. Without government intervention, we are told, this area will remain blighted. (Critics of the project are betting it will be Section 8 subsidized housing before this is all over.) So our good intentioned government officials have all buckled under pressure and the entire city, county, state, and feds will take up the sword to save this area of town. Hmmmm.....last I looked, that means you and me and everyone. Our taxes are committed to saving the Firestone / Loray Mill, whether we wanted to or not. If this were just one instance, it might be viewed as an anomaly, but it isn't. Every town in America now has an "Economic Development" office that is a quasi-government agency combined with private sector interests. Our city and county have committed our taxes to many of these "Economic Development" schemes. We have bought land and given it away. We have spent money on site preparation. We have forgiven taxes. We have given utility credits. We have guaranteed loans. In short, we in the private sector are forced to prop up certain chosen business ventures collectively. Just like Solyndra at the Federal level, this situation is occurring every day all over the country. We are on the hook. All of us. While we get poorer, the chosen few run away laughing all the way to the bank. Our bank. Taking our money. And politicians just keep doing this, over and over again at all levels of government. I can label this as Fascism or Communism. Either way, it isn't the American way of life as I know it is supposed to be. It is tragic, frankly. So how collectivist are we today? Deeply embedded. Somehow government has given itself permission to steal from all to favor the few. Who are these people? They have convinced themselves collectivism is O.K., as long as it is for "Economic Development." The officials who spoke to me about this latest instance told me the goal is to "increase the tax base." They say this will prevent tax increases on the public. Really. Really? But after years of this insane methodology, have taxes reduced? Not at all. Or have debts increased? By quite a lot. And is "increasing the tax base" the proper function of government? Not in my Constitutional handbook. Yep, they are increasing the tax base alright. Getting more from you and me and everyone else ...sucking the golden goose dry.